Let’s not forget about the violence from Legacy Fighting, WSOF and Bamma over the weekend. What an absolutely ridiculous weekend of action. 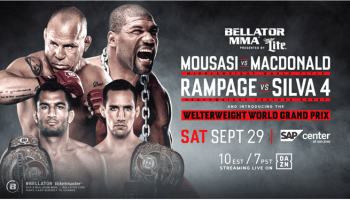 We saw Bellator on Friday, as well as Tim Means retiring Pete Spratt with a vicious hellbow in their bout on Legacy Fighting 23. Thanks to Zprophet for the .gifs. Somehow Kyle pulled off the win despite knocking down Arvloski twice, I thought he won round 1 and 3 clearly, but Arvloski ended up getting the decision.